Concept mapping and mind mapping software is used to create diagrams of relationships between concepts, ideas, or other pieces of information. It has been suggested that the mind mapping technique can improve learning and study efficiency up to 15% over conventional note-taking. Many software packages and websites allow creating, or otherwise supporting, mind maps. Using a standard file format allows interchange of files between various programs. Many programs listed below support the mm format used by FreeMind, which is an XML text format of tagged objects. The following tools comply with the Free Software Foundation's (FSF) definition of free software. As such, they are also open-source software. 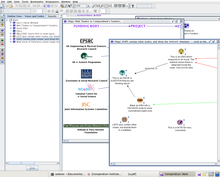 The following is a list of notable concept mapping and mind mapping applications which are freeware, and available at no cost. Some are open source, and others are proprietary software. Mind maps, spreadsheets, fishbone diagrams, tree charts, org charts. yEd Proprietary, yEd Concept mapping, Mind mapping Windows, OS X, Linux, cross-platform ? ? ? can be used to draw different kinds of diagrams: flowcharts, computer network diagrams, UML diagrams, BPMN diagrams, mind maps, organization charts, entity relationship diagrams, and many others. The table below lists pieces of proprietary commercial software that allow creating mind and concept maps. 3D Topicscape 3D-Scape Limited Windows Desktop application that presents mind maps as a 3d scene where each node is a cone. Imports MindManager, Personal Brain, FreeMind, text and folders. ConceptDraw MINDMAP CS Odessa LLC Windows, OS X Desktop mind mapping and brainstorming software, for business, education, or personal activities. Integrates with Microsoft Word, PowerPoint, Project, MindManager, FreeMind, and XMind. Compatible with Twitter, Skype, and Evernote services. Cliparts and symbols in libraries. Export options to Graphics, PDF,PS,, EPS, Microsoft Office (Word, PowerPoint, Excel),HTML,SVG and Visio. Android, iPhone, iPad applications, providing offline access to diagrams. Presentation software that supports free form placement and zooming on a single sheet. Qiqqa Quantisle Ltd. Windows Minds maps for academics oriented around their research papers, notes, and annotations. TheBrain TheBrain Technologies Windows, OS X, Unix, Unix-like Graphically intensive and customizable GUI, extremely cross-platform. Notes, calendar, Microsoft Outlook features. Multiple parent node ability. Visual Mind Mind Technologies Windows Supports collaboration (client–server) mode. ^ Farrand, Paul; Hussain, Fearzana; Hennessy, Enid (May 2002). "The efficacy of the 'mind map' study technique". Medical Education. 36 (5): 426–431. doi:10.1046/j.1365-2923.2002.01205.x. PMID 12028392.